Domestos bleach disinfects surfaces around your home. UK's #1 bleach. Kills 99.9% of bacteria and germs, and removes stains. Original Extended Power bleach works 3x longer. Handy 750ml of Domestos cleaning power. Use with a Domestos Toilet Block for maximum protection. Domestos kills germs dead. Domestos Extended Power Bleach, with anti-limescale active molecules sticks even below the waterline to remove stains and help prevent the build-up of limescale for up to 3x longer than before. This handy 750ml bottle of Domestos Original Thick Bleach is perfect for everyday use in the bathroom and kitchen where this conveniently sized bottle will help you to protect your family from the germs in your home. Domestos Original Bleach gives you the longest lasting protection from germs, whilst helping to prevent the build-up of limescale, which is where germs grow. Domestos Original bleach is a multi-surface cleaner for around your home, it can be used as a bathroom cleaner or even as a drain cleaner. 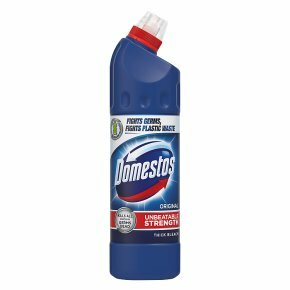 This handy 750ml bottle of Domestos Original Bleach is a great, easy-to-use option for around your home, so germs, watch out! How to use: Apply this thick bleach under the rim of the toilet and leave it overnight to kill germs and remove stains. Suitable for use in homes with septic tanks. Domestos have been protecting families against germs since 1929. Today, Domestos continues to protect millions of families with its full range of cleaning products, including thick bleach and bleach sprays, which can be used as a multi-purpose cleaner all around your home, as a bathroom cleaner, or even as a drain cleaner. Toilet wipes, toilet rim block, and sink and pipe unblocker products are also available to keep your home hygienic. Domestos doesn?t just protect families at home though; they fight poor sanitation globally too. They've helped more than 10 million people gain access to a clean and safe toilet, and thousands of children have benefited from clean water and toilet facilities in their schools; helping improve attendance and educational achievement. Support their work and help to empower millions of families to have clean and safe toilets. Visit Domestos.co.uk to find out more.